Our 315 non-smoking guest rooms have been beautifully renovated under our multi-million dollar upgrade. All Semi-Suite guest rooms feature two double Simmons Beautyrest Pillow Top beds or one king bed refrigerator microwave coffee maker iron and board hair dryer and an electronic safe large enough to accommodate a laptop computer. 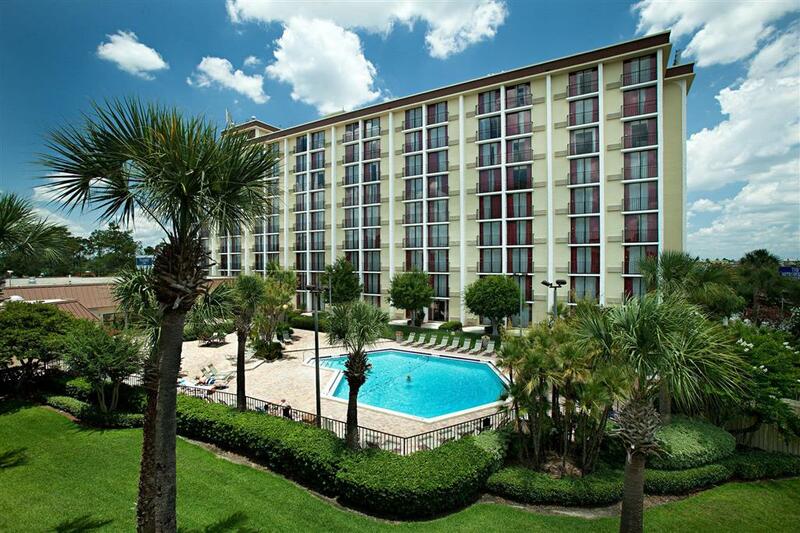 We also provide free Wi-Fi and cable television with Disney Channel and in-room movies. Be sure to visit our large swimming pool video arcade and our many dining options - Shogun Japanese Steak House International Pub Palms Dining Room and Lite Bite Mini-Market-Deli. The Palms Dining Room provides buffet style dining and hosts a Kids Eat Free Program children under 9 years 1 child per 1 adult. If you are planning to visit any of Orlandos theme parks we offer free scheduled shuttles to SeaWorld Orlando Universal Studios Resort and Wet n Wild. Our guest services desk can also handle any of your needs including attraction tickets restaurant reservations car rentals and airport shuttles. Please call us toll free at 1-800-999-6327 with any questions you may have. In the middle of all the fun. Wet N wild water park is across the street Universal Studios and Sea world are just 5 minutes away. Its only 15 minutes to Walt Disney World Resort and world-famous International Drive surrounds you with an endless choice of entertainment and shopping. All Reservations must be guaranteed by a valid major credit card. Credit Authorization for 1st nights room plus tax will be made at least 1 day prior to arrival. Reservations will be cancelled if authorization is Denied. Hotel requires a 24 hour cancellation notice by 4 pm EST one day prior to arrival unless otherwise stated on your confirmation. Exceptions may apply - Please see rate rules. Full American Buffet breakfast featuring assorted fruits hot and cold cereals two types of eggs bacon sausage Hash brown potato pancakes or French toast and much more. Authentic Japanese steak house Shogun will delight you with the entertaining skill of Teppanyaki chefs as well as the culinary masterpieces they create with beef shrimp chicken and lobster right before your eyes. Its the perfect choice for family gatherings and small groups.